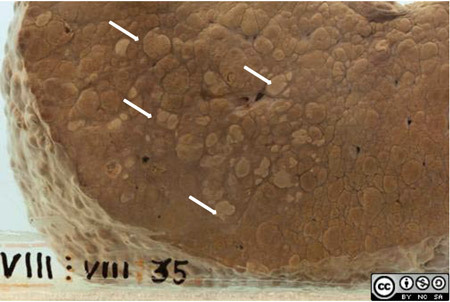 Cut surface of the liver. This patient was a 31 year old man with a 3 month history of abdominal swelling, epigastric pain, weight loss and jaundice. He drank 3 bottles of wine a day. 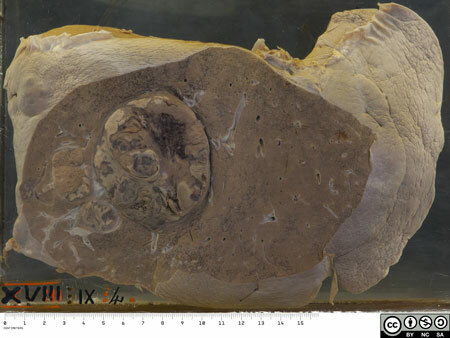 On examination he had gross ascites and hepatomegaly. A week after admission he had an episode of haematemesis and gastroscopy showed that he was bleeding from oesophageal varices. Despite sclerotherapy he had repeated episodes of bleeding and developed signs of liver and respiratory failure. 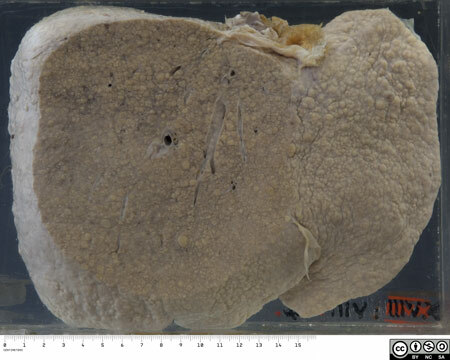 At autopsy the liver weighed 2530g (normal ± 1500g). It is diffusely riddled with nodules, compatible with cirrhosis. 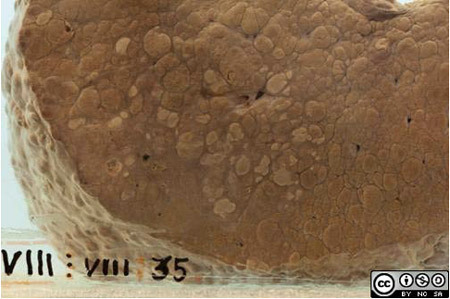 On the cut surface it can be seen that the nodules are mostly >3mm and up to 1cm in size, so this is predominantly a macronodular cirrhosis. A close up of an area in the right lobe shows that quite a few nodules have a suspicious fleshy appearance. Microscopy confirmed the macroscopic appearance of cirrhosis. In addition there was extensive replacement by poorly differentiated hepatocellular carcinoma. Cirrhosis is a response to diffuse injury of the liver parenchyma. which together result in the nodularity. The architecture of the entire liver and its vasculature is disrupted. 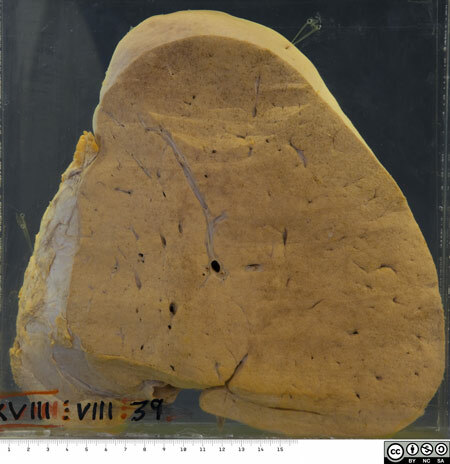 This fragment of cirrhotic liver was sampled by liver biopsy. 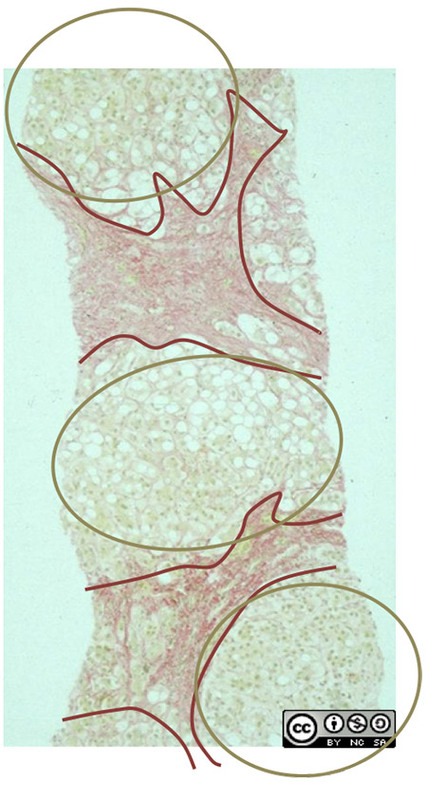 Fibrous septae (staining red) surround regenerative nodules of liver cells. 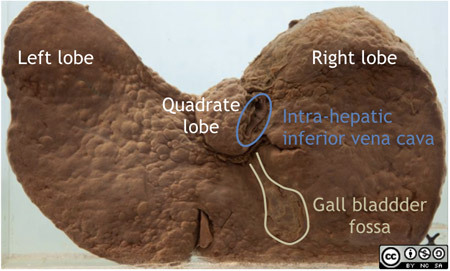 The normal liver lobule structure is distorted. Portal tracts have largely been obliterated by the fibrosis. the obstructed portal circulation leads to portal hypertension. The central venule of each liver lobule has disappeared. the disrupted lobular circulation leads to hepatic dysfunction. or may have a multifocal origin, as in this case. It often but not always arises in a cirrhotic liver. Accumulation of DNA mutations during repeated cycles of regenerative cell division is an important factor in the pathogenesis of HCC. The most important causes of both cirrhosis and HCC are alcohol and chronic viral hepatitis (B & C). Sub-Saharan Africa has historically had a high prevalence of hepatitis B (± 10%) and consequently a high incidence of HCC (29 per 100 000 in South Africa, 113 per 100 000 in Moçambique). In this context HCC presents in young adults (20 - 40 years, more often male) who have acquired hepatitis B in childhood or even in utero. The inclusion of the hepatitis B vaccine in the childhood immunisation programme in South Africa since 1995 will almost certainly reduce viral cirrhosis and HCC over time. 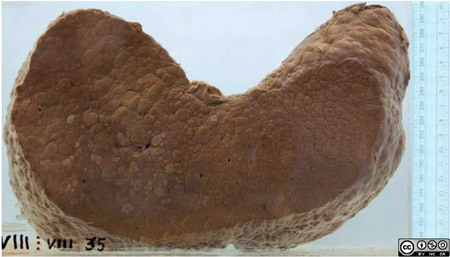 A typical fatty liver from a patient with high alcohol intake. 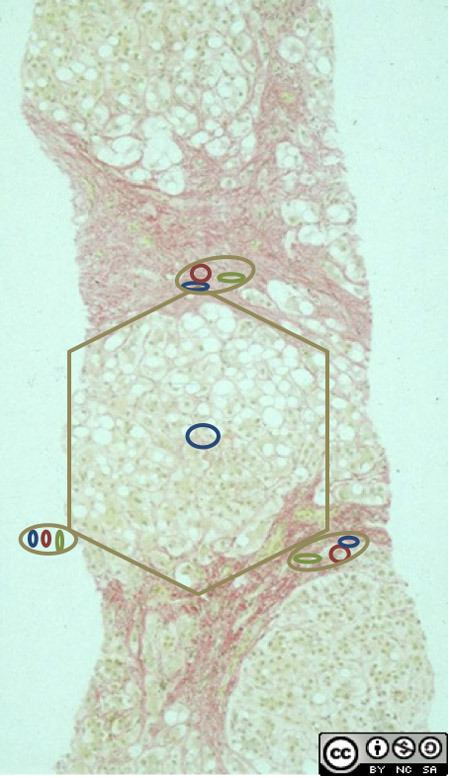 Early changes of cirrhosis were seen on microscopy. 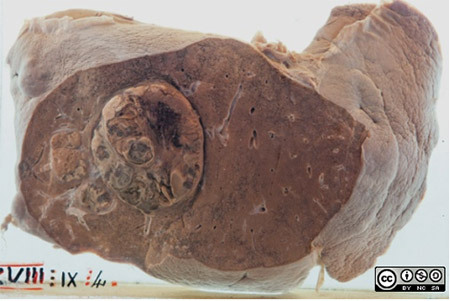 Predominantly micronodular cirrhosis typical of alcoholic liver disease. 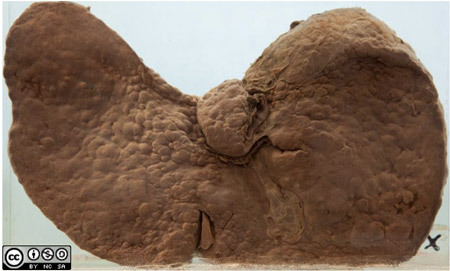 Hepatocellular carcinoma occurring as a single large nodule with a few daughter nodules.